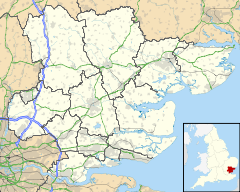 Mountnessing is a village and civil parish in the Borough of Brentwood in south Essex, England. It is situated to the north-east of Brentwood, south-west of Ingatestone. A large proportion of the houses are situated on the Roman Road (formerly the A12 road until the village was bypassed in the 1970s) between Brentwood and Ingatestone. The village is approximately equidistant between the two closest railway stations of Shenfield and Ingatestone. Features of Mountnessing are its windmill and the parish church of St Giles. An annual village fete is held in July. In the "Windmill" field there is also a village hall, cricket pitch, football pitches and tennis courts. It has three pubs, The George and Dragon, The Plough and the Prince of Wales, a butcher's and a hairdressers. There is a primary school, Mountnessing C of E, on Roman Road. St.Giles church is located midway between Mountnessing and Billericay. ^ "Civil Parish population 2011". Neighbourhood Statistics. Office for National Statistics. Retrieved 4 September 2016. This page was last edited on 10 November 2018, at 13:01 (UTC).